Conservationists in the Pacific Northwest are celebrating, as a federal judge ruled Wednesday that efforts by the US government to assist the recovery of endangered fish, impacted by four dams on the Snake River, are woefully inadequate. In his ruling, US District Judge Michael Simon in Portland, Ore., lambasted the federal government's current plan to ameliorate the effects of the dams, saying it violates both the Endangered Species Act and the National Environmental Policy Act. Far from being the first time the situation has been considered in the courts, this is just the latest in a legal battle that has spanned at least 15 years, and it marks the fifth time that the court has rejected the government's efforts as insufficient. 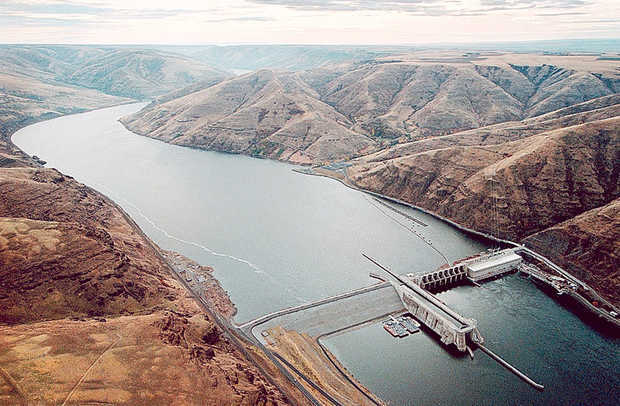 "For more than 20 years, [government agencies] have ignored the admonishments of Judge Marsh and Judge Redden to consider more aggressive changes to the FCRPS [Federal Columbia River Power System] to save the imperiled listed species," writes Judge Simon. "Despite billions of dollars spent on these efforts, the listed species continue to be in a perilous state." In his sweeping 149-page consideration, Simon found that the agencies in question, including NOAA Fisheries, the Army Corps of Engineers and the Bureau of Reclamation, had consistently focused on trying to revive the area's 13 salmon and steelhead runs using methods of habitat restoration that sought to avoid any compromise of electricity generation. While Simon did not dictate what specific options the government should consider, he did suggest that it "may well require consideration of the reasonable alternative of breaching, bypassing, or removing one or more of the four Lower Snake River Dams." "In truth, already well known to others but not to me, these four Snake River dams are obsolete for their intended purposes and are being maintained at huge taxpayer expense for the benefit of a very few users." As Mr. Balcomb goes on to explain, a knock-on effect of the dams' decimation of the fish populations is to starve another endangered species: the southern resident killer whale, which inhabits the nearby ocean. One of the lethal characteristics of the dams is the warm temperatures they promote in the bodies of water they restrain, a phenomenon responsible for the death of hundreds of thousands of adult salmon last summer, according to Todd True of Earthjustice, an environmental law firm representing some of the plaintiffs. "We need to seriously consider a plan that retires and removes the four lower Snake River dams," said Mr. True in a statement. "Only action on this scale has the potential to allow wild salmon to survive and recover in light of the vivid threat they face from a warming climate." The government has until March 2018 to present a new plan.